The freshness of the first day of a trek can give way to tiredness next morning if you don’t sleep well in night. That is why you should carry a comfortable backpacking pillow with yourself, for it helps you sleep long and deep outdoors. Read on to learn which are the best picks for your next backpacking trip. First, however, let’s check out the factors to consider when buying a backpacking pillow. When going for a trek, you would want your backpack to be as light as possible, and so picking a pillow that occupies a very little space is a good idea. While inflatable pillows deflate to a really small size, they are not only ones that are highly portable. Many pillows come with a removable inner covering, which, once removed, makes the pillow small and easy to carry. Ensure the size of the pillow is adequate for you. Side sleepers may require a lengthier and thicker pillow than back sleepers. Whereas, a small, flat pillow will work best for stomach sleepers. These pillows don’t occupy much space in your bag—and that’s their biggest advantage. Another advantage is that they are not as costly as some others, for example, down backpacking pillows. Some inflatable pillows come with a hard nylon exterior and tend to make noise whenever you turn your head a little. You might want to stay away from them, unless, of course, you are a sound sleeper and a bit of noise doesn’t bother you at all. Offering the best combination of portability and comfort, these pillows contain a thin layer of padding around the centre, which is filled with air. They are light and small, yet reasonably comfortable. 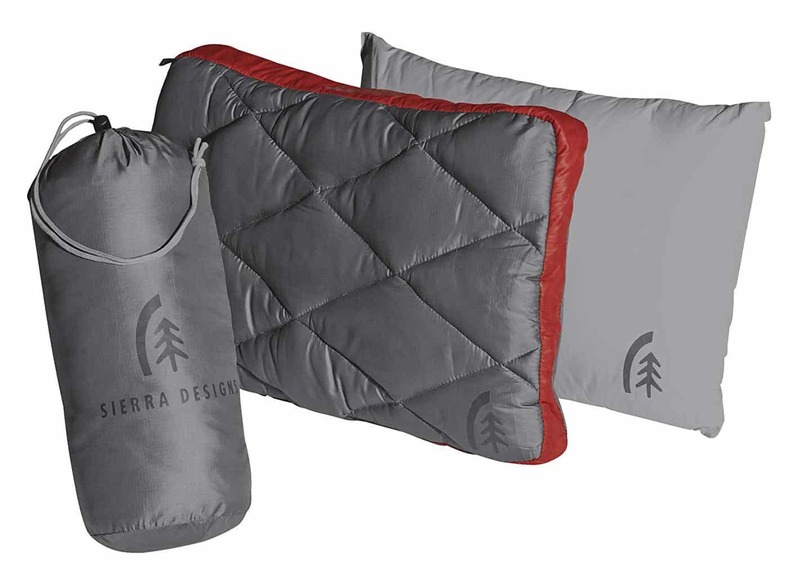 A combination of a synthetic inner and down pillow on top, the DriDown Pillow is a good option for backpackers, as it is light and very usable. With the synthetic pillow inside, it weighs 5.8 ounces; without it, a mere 2.8 ounces. Carrying it on those tough trails won’t hurt your back a wee bit. You can use spare clothes as inner filling, even a little, a few days’ old clothes will do (and that’s a relief). The covering is quite thick and doesn’t let odor pass through. The pillow is a little on the small side. Some side sleepers may find it a little small. The good part, though, is the sides are almost as lofty as the middle. Because it’s not big, stomach sleepers too can use it. The quilted down is soft to touch. You will enjoy the cozy feeling it gives when you lie on it. The pillow keeps you warm, but not so much that you start feeling uncomfortable after lying on it for a few hours on a warm night. I have found an additional use of the Big Agnes Pillow—as a back cushion. When half inflated, it works superbly as a back cushion, allowing me to sit on a chair for long hours without any discomfort. If you buy it and experience slight back pain every now and then, you might want to try this too. The Kelty Pillow is comfortable, but there’s a caveat attached. By itself, it goes almost completely flat—thinning to half an inch—when you lay your head over it. The pillow comes with pocket at the back, through which you can put clothes inside to make it sufficiently thick. I, however, prefer using a cheap inflatable pillow as inner filling. The pillow surface is comfortable and soft to touch. It also keeps your head a little warm, so that you lull into a sound, cozy sleep. The warmth is agreeable, not so much that you feel overheated. However, the stitching could have been a little bit better. It is not like it comes out after a few trips, but it does have a non-quality look to it. This pillow, however, is not pricy. Considering that, it does offer good value. Don’t let the small size fool you. When it comes offering loft, the Cocoon Pillow is as good as any. If you like lots of loft in your pillow, you might really like it. The pillow fabric adds comfort and warmth, besides being soft to touch. It feels nice when you lay the head over it. But, and it could be a big ‘but’ for many, the pillow has a bit of rocking effect. It didn’t bother me, but my husband (we bought two pillows), found coping with it tough. The pillow also offers great portability. It deflates into almost nothing. The other benefit is that you can set it up in nanoseconds. All in all, this is a good backpacker’s pillow. The rocking effect, however, can be a concern for some. And one more thing: you can’t select the color. It might matter to some, though personally I couldn’t care less if mine was blue instead of green. The first thing that catches your eye when you at look it is its colors. You might love it or don’t like it, but you sure will not be able to take your eyes off it for a few seconds. If you like stylish things, you might want check this product out, for there are not many like it. Looks apart, this pillow is also comfortable to use. It is soft yet manages to provide good support to ensure you have a good night’s sleep and wake up without a neck wink. The surface, made of soft polyester, gives the pillow a comfortable feel. The pillow self-inflates upto 50%. If you want more bulk, just exhale a few times into it, until you got it as high as you want. Because it self-inflates, it can be taken out of the bag and used instantly. Oh, and did I tell you it comes with a life-time warranty? Yes, it does. Plus it also has the standard Amazon’s 30-day money back guarantee on it.